Via an article published yesterday in the LADOT Bike Blog, the department announced that it would be adding “approximately 20 miles” of “new sharrows… over the course of the next year.” The article includes a spreadsheet listing of where these sharrows will be implemented. 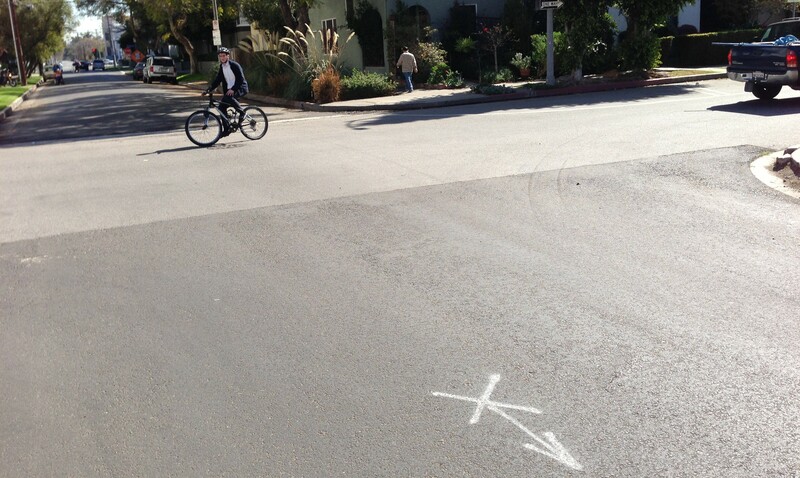 Screenshot of streets where LADOT announced new sharrows for 2013. Click to go to Google Map. Screenshot of San Pedro detail of streets where LADOT will implement sharrows in 2014. Click to go to Google Map. Streetsblog hasn’t had time to bike out and measure all of these streets, but, after a preliminary review, it looks pretty good. One odd inclusion on a “new sharrows” list is 4th Street in Koreatown-Hancock Park. 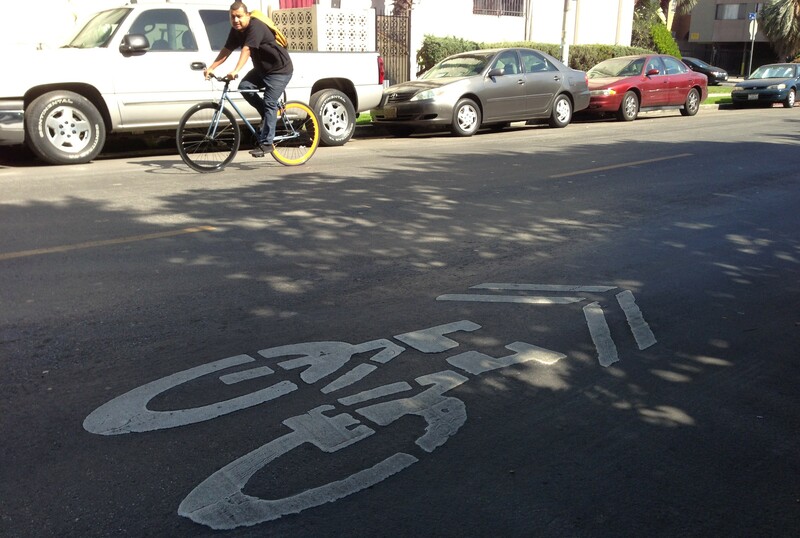 4th Street already received sharrows in 2010, so these certainly wouldn’t count toward new mileage. LADOT’s 2014 list includes two stretches of 4th Street: Oxford to Norton, and Cochran to La Brea. As of this morning, there still are sharrows on every block of 4th Street from Oxford to Norton. One opportunity that appears missing in the LADOT 2014 sharrow list would be asymmetrical treatments, generally most useful on somewhat hilly streets. Sharrows can be added in the downhill direction, with a bike lane going uphill only. The sharrow/lane facility is apparently common in Seattle. Los Angeles only very rarely uses asymmetric lane/sharrow treatments, generally at bottlenecks where streets narrow for a short distance, including Burbank Blvd and Laurel Canyon Blvd. There are few hilly streets in San Pedro, also Federal Avenue, maybe others, where there may be width to add just one 5-foot bike lane in the direction where it’s most needed. Streetsblog will continue to monitor and analyze bikeway implementation throughout the region. 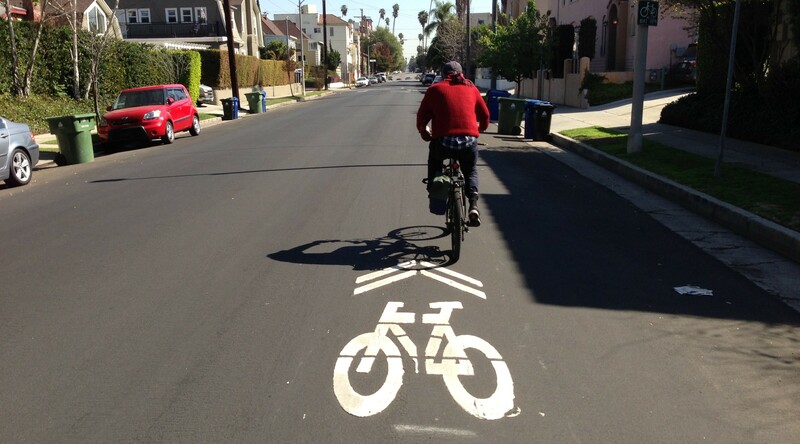 Forget the sharrows, these pictures made me jealous because the road surfaces looked smooth. The haggard, utility pockparked potholed steel plated disaster of my east coast city is a much bigger hazard to me personally than the lack of sharrows. This is much better than the plan from a couple years back to do 20 miles of Sharrows. That plan seemed completely haphazard. Recently, I was at a meeting where a LADOT bikeways traffic engineer said in public that it costs about $10,000 a mile to install sharrows and about $50,000 a mile for bike lanes. The installation of sharrows on a major street seems to be an admission by the city that there is little hope in the near future for bike lanes to be placed there. Los Angeles has an abundance of those also. In 2011, 38% of the streets were rated in D or F condition. I’d guestimate that fewer than 5% of these would be considered “major streets.” I’d rather have a mile of bike lane than 10 miles of sharrows… But I think that most of this list is ok. Only a few places where bike lanes fit easily. 1. They signal all road users, in a very easy-to-understand way, that bikes are allowed on the streets, even where there are no bike lanes, and moreover, that on narrow streets or streets with narrow lanes they should be expected to ride in the same lane with cars, not shoved into the door zone or the debris-strewn gutter. Especially in cities unused to biking, they announce, and teach, vehicular cycling, which, no matter how one feels about it, will always be a part of urban cycling — since it’s unlikely that any city will have a protected bike lane on every single mile of road. 2. They potentially provide a wayfinding system for any gaps between more advanced infrastructure. When two protected bike lanes run close to each other, a quiet street can be marked with sharrows to carry cyclists between them. They are already used as pathfinders in many intersections, to guide cyclists across large cross streets where bike lane protection is interrupted. A research study of 17 of the largest U.S. cities had an average increase of one-percent in bicycle commuting modal share for every one-mile of bike lanes per every square mile. The Netherlands did tests where they found that installing a very closely spaced network of bikeways in a city increases bicycling by making it more convenient, fast and direct. This has also been shown to be true with the placement of bicycle sharing stations. Amazingly, the LADOT is in the process of installing a very high density of bike lanes in the Wilmington area of Los Angeles. If you look at the bicyclela.org bike map and click on bikeways in development at the bottom of the screen you’ll see what looks like a lattice of bike lanes. There will simply be nothing else like this level of density for bike lanes in the county. Comparing upcoming Census Bureau American Community Survey results for this zip code to other areas such as Venice could give some much needed data to support installing bike lanes in Los Angeles. Western just north of Santa Monica, holla! Sheesh, same old same old. This is progress in milimeters, when it is needed in miles. I’m still not impressed with sharrows. I think they’re a waste of paint. I am convinced that encouraging everyone, people using cars, bicycles, and walking that our public road systems are for everyone’s use and not just for people using cars will get us to safer traffic behavior faster and better than trying to erect physical or paint barriers between each mode.